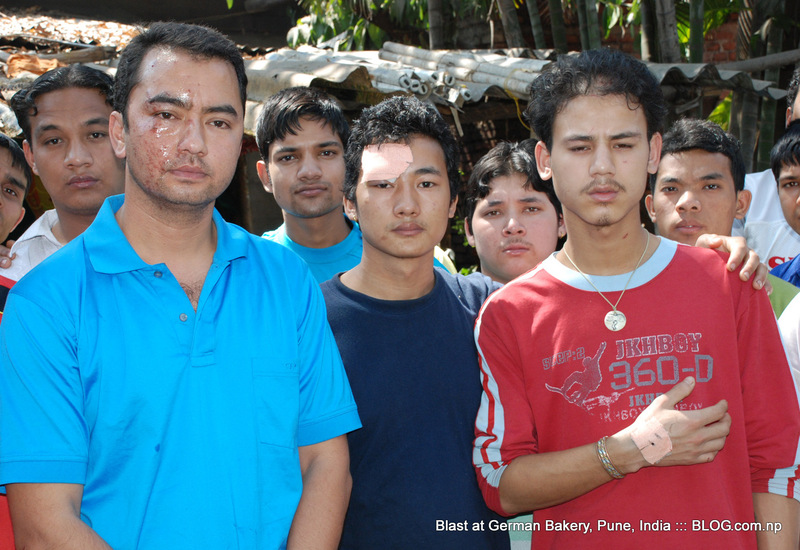 Blast at German Bakery, Pune | United We Blog! 1. There was a Nepali in Hotel Taj Mahal’s kitchen on 26/11/2008. Another Nepali was serving guests at Leopold Cafe, on that fateful day. He was injured in the attack. 2. When several Indian soldiers came under a deadly avalanche in Kashmir recently, a Nepali rifleman serving in the Indian army’s Gorkha Rifles was among those who died. Four Nepali nationals have been injured in the deadly German Bakery blast in the Indian city of Pune on Saturday (yesterday) that killed nine people. The nationality of one of the dead could not be ascertained, but his name is said to be Gokul Nepali. Some workers at the Bakery said that their colleague 32-year-old Gokul Padewa from Nuwakot district in Nepal have been missing since yesterday. Padewa was inside the Bakery when the bomb exploded. It was not clear till late Sunday (today) if Gokul Nepali and Gokul Padewa were the same person. At least 55 people were injured in the incident. The injured Nepalis work at the Bakery that is run by their compatriot from Nuwakot district in central Nepal. Two of the injured–Paras Rimal and Manish Shrestha–hail from Nuwakot, while Ganga Magar and Pravin Panta are from Bara and Kathmandu respectively. Paras was undergoing treatment at local Sassoon Hospital until late afternoon today. The Hospital sources said they could not verify Gokul Nepali’s address. Also, the name and address of two other dead persons has not been known. A total of 70 Nepalis work in the Bakery that is popular among foreigners who go to the nearby Osho Ashram. a Jewish Chhabad house and a synagogue are half a kilometer away from the bakery. A few Nepalis who tried to meet owner of the Bakery, Gopal Karki, said their effort was futile. “May be he is too busy helping police in investigation,” said a Nepali living in Puna. Originally opened by a German, the Bakery is being run by Karki for the past 25 years. i was so sorry to hear this news..
the german backery is a place of peace where all the hearts from evry nation are joined together with love, a lot of that depend on the great staff, nice warm beautifull souls, who i remember, loved seeing them every morning at the breakefast. im wishing them all good health, hopping that they will never meet this evilness in their lifes never again. my heart is with you india, my heart is with you pune, my heart is with you german backery..
Friends, I am still shocked about what has happened.I am very touched and feel with you. The German Bakery has been a home for me since a lot of years; always very good food and drinks, very friendly service and a very good atmosphere. Hope you all will recover and rebuild the German Bakery. any attention-grabbing article like yours. It is beautiful worth sufficient for me. In my opinion, if all web owners and bloggers made excellent content material as you did, the web can be a lot more helpful than ever before. if you have any idea that this thing happens only with the third world county then you are entirely wrong because it actually happens in United States. $3 for a cup of coffee. Now, here the question arise that how TENS Unit machine really works. This is true of the prescription strength and the over-the-counter formulas. But getting help from physiotherapists has become common all over the world nowadays. 2) You – you do the planning, and hire Private Investigators and lawyers. as the bankruptcy of one of the biggest platforms in the world exchanging Bitcoins has called into question the future of this digital money. Web Analytics Help You Detect Fraud and Incompetence. that guides that will help you become the ultimate winner in agario hack by gathering brand-new agario cheats.